Robust is a really good word! This powerful golden-amber beer has loads of sweetish malt in both nose and taste, but it has a pronounced hoppiness as well. Small brew pub. Hefe Trube is our beer of choice. This exemplifies the what a micro brew should be. My wife Kathy and I visited Maroldsweisach in Dec. and Jan. 2002. My father was born there and I got to meet my Aunts, Uncle and cousins for the first time. We rented rooms at the Hartleb Brewery, the hospitality, food and beer is excellent and we can't wait to get back. 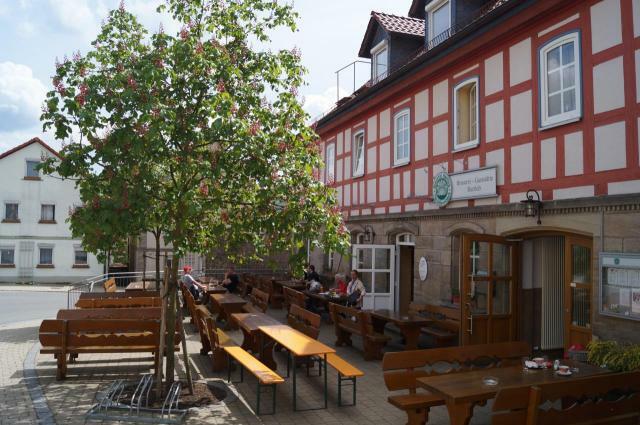 I visited the Brauerei Hartleb for the first time after completing a nearby volksmarch in 2003. I liked the beer so much, I made a special trip back to have a few empty 2 and 3 liter bottles filled. To me, this beer is some of the best I've had in Germany. I left a message before but having been treated to their Hefetrube again this last summer a couple times, I want to restate that it is among the best beers in the world. The only beer I would give the edge to is the unfiltered quality control beer at the Pilzner Urquel brewery. Interesting hop pronounced beer which probably wouldn't differ much from other beers if it weren't unfiltered. But this way it's really very drinkable. The basalt stone area obviously adds some hardness to the water.